Last week, I participated in a colloquium in at the University of Göttingen. 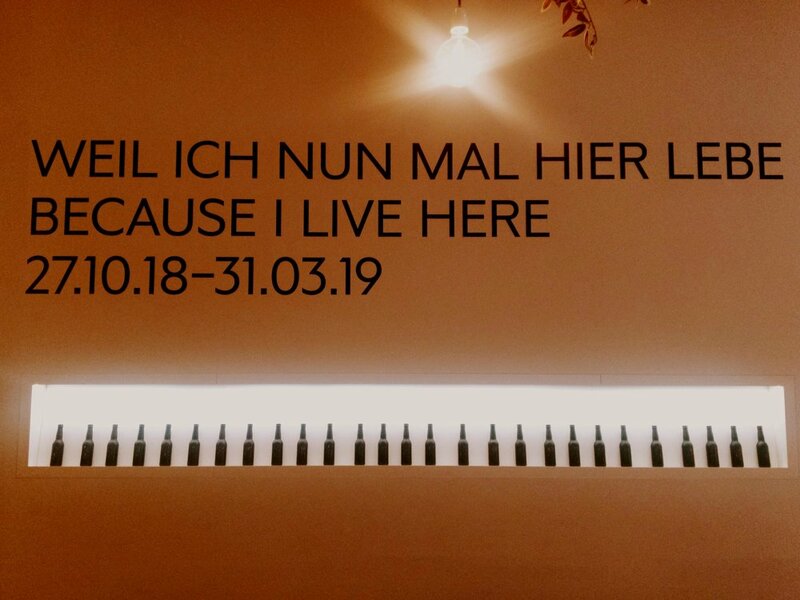 I arrived in Germany a day early to visit an exhibition on structural racism, curated by the Museum Moderner Kunst in Frankfurt called “Weil ich nun mal hier lebe” (“Because I live here”). It’s difficult to talk about racism in Germany — given the dogmas of German exceptionalism, the particular contestations around the German term for race (Rasse) and the entrenched myth of an ethno-culturally homogenous Germany. So the issue of structural racism is sometimes met with blank stares and confusion, or verbalised with a sceptical ‘na, ja...’ In short, the exhibition is, by its nature, very ambitious. Actually, I had heard about the exhibition when I saw a news article about a beautiful documentary film made by my friend, Natasha Kelly, called “Milli’s Erwachen” (“Milli’s Awakening”). For me, it was the most moving piece of the lot, followed by trio of interviews by spot_the_silence and the Forensic Architecture installation on The Murder of Halit Yozgat. There were 14 pieces in the exhibition, and the programme booklet is online. Milli’s Awakening is a really gorgeous compilation of narratives and video portrait-interviews of Black women artists and thinkers of different backgrounds and generations. The women, in the settings of their daily work, talk about creativity, heritage, experiences with racism, relationship to Germanness, sexuality, gender identity, artistic production, and university life… They talk about ancestors and absences. The interviewer is off camera, and the viewer is placed into intimate conversation with the women, in a serene black and white space. They report on an odyssey through German spaces, rural and urban and across several generations. The pace of the work is tranquil and melodic, and the interview material is heavy and direct and real. It’s impossible not to get a sense of the tender respect for these women, their praxis and the stories that comes through in the direction of the film—partly because of the silences that are permitted to hold the scenes between witty retorts, fierce performances, demonstrations of artistic practice, and heartbreaking memories. The film is mandatory viewing. I’m pleased to have bought a copy of the transcript (in book form, pictured above). Kudos, Natasha! The interviews by spot_the_silence were short and brutally pointed and moving. Mouctar Bah reflects on his experiences as an organiser and activist around the death of Oury Jalloh. He recounts being harassed by police, having his Dessau internet cafe license withdrawn for allegedly tolerating drug users on the premises. He tells of being strip searched. He notes how families and activists are made to expend energy on a constant basis, as they are revisited by these incidents of violence and humiliation during the most banal moments of everyday life. This was echoed by Ibrahim Arslan, who survived a right-wing arson attack on his flat in Mölln in 1992—where he lost his grandmother, cousin and sister. He recounts how the city of Mölln did not want to cede control over the selection of speakers at the annual memorial over to the families of the deceased, making families feel marginalised in telling their own stories. He remembers how authorities first accused his father of being involved in the arson. He and other survivors were told to either return to the flat once it was repaired or to take up residence in an asylum centre, even though he had never sought asylum (he was born in Germany). He lived in the flat for a further five years. He continues to host a yearly remembrance speech, called Mölln Speech in Exile, that travels from city to city. Then, there was the interview of Mai-Phoung Kollath, who was a contract worker in Dresden in the early 80s as a result of an agreement between the DDR (German Democratic Republic) and Vietnam. Once Germany reunified, the Vietnamese were told to leave. She endured hateful, racist abuse and watched as neo-Nazis infamously set fire to the sunflower house (a large apartment block in Rostock housing the central asylum reception centre for the region, as well as apartments for Vietnamese guest workers) in 1992. She has since been an organiser for a Vietnamese-German peace organisation. Forensic Architecture, based in London, is a practice-based academic unit that fuses forensic-style inquiry with state-of-the-art space, sound and design techniques and intervenes into real cases and controversies. The work allows for a level of precision in critiquing the official narrative of events—in this case, the death of a man named Halit Yozgat, who was a casualty of the NSU (National Socialist Underground) murders. This installation, a version of which I have seen several times, pulls together footage of tests, diagrams and explanations of competing timelines, and a spatial layout of the scene to refute the claim by a police officer that he was unaware that Yozgat was shot, as he himself sat in the internet cafe while the shooting occurred. There were other memorable pieces in the show as well. I learned from one video installation that the German public finds it really hard to imagine that neo-Nazis ride bicycles, because of the friendliness associated with cycling. You’ll have to see the exhibit (or know the NSU case fairly well) to know why that’s relevant. From Hito Steyerl’s video installation series ‘Normality (1999-2003)’, I also learned about the desecration of over a dozen Jewish burial grounds and the death of Algerian asylum applicant, Farid Guendoul, that occurred right around the time I moved to Germany. Interestingly, Guendoul’s case (he ran into a door while being chased by neo-Nazis and bled to death) is still used in core legal debates around the types of charges that can be brought against perpetrators in circumstances where they have not physically touched their victims. The stories circulate through the spaces, audibly blending into one another as the visitor moves through the rooms and alcoves of the tower building. The exhibition transmits the weight, pervasiveness and wide-ranging inflection of socially-embedded racism in a way that an academic article, alone, rarely can. It is important to have these very different works in the same space. The exhibition is on until the 31st of March, so visit, if you happen to be in Frankfurt.